Yesh Atid chairman expresses solidarity with Republicans during meeting with delegation headed by Peter Roskam. Yesh Atid chairman MK Yair Lapid met with a delegation of senior leaders from Chicago on Wednesday afternoon, who accompanied Republican Congressman Peter Roskam (IL-6th District) on a special trip to Israel. 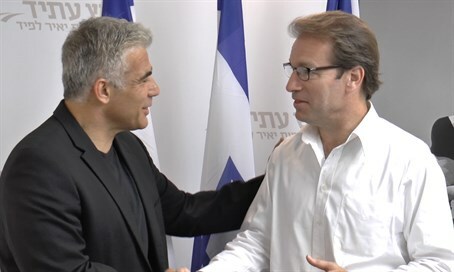 In his opening remarks, Lapid thanked Roskam for his actions in leading the fight against the Boycott, Divestment, and Sanctions (BDS) movement. Roskam is the co-chair of the House Republican Israel Caucus, and presented a monumental bill last year to ban academic boycotts against Israel at the federal level. "I want to thank you for coming here," Lapid stated. "I know you work very hard on the fight against BDS and the boycott of Israel and it is very important to us." Lapid also related to the Iran nuclear deal, stressing the deep concern of Israeli officials. Roskam has also been a particularly vocal critic of the deal, introducing a bill designed to crush the deal in Congress which may dodge even a presidential veto. Roskam needs at least 290 of the 435 members of the House of Representatives to gain a two-thirds majority in overruling the presidential veto. He already has at least three members of the House leadership, 18 of 22 House committee chairmen and 23 of the 25 Republican members of the influential House Foreign Affairs Committee. "I believe we both think that the agreement is bad and is a danger to Israel," Lapid said. "It is important for me to tell you that we refrain from interfering in the internal affairs of American politics, but we are expressing our deep concern the agreement and results to have toward Israel and puts Israel in danger." "Our [destruction] is Iran's stated goal so we have reason to be more concerned about this than others," he added. During the meeting, Lapid said that he would like to thank the United States for the assistance and help for Israel and the important friendship with the United States. "I am very happy to be here with the Jewish Federation of Chicago," Roskam responded. "Israel has many friends in Congress in general and Chicago in particular." Roskam's remarks surface just days after Chicago Jews rejected the deal with Iran, via the influential Jewish United Fund (JUF) organization. The move could be seen as a major blow to US President Barack Obama, who is heavily lobbying Congress to pass the deal and who launched his career in Chicago.